DC Universe Online Gives Robin a Voice: Wil Wheaton! 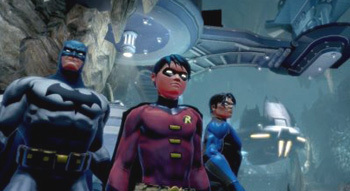 As if DC Universe Online's voice cast wasn't cool enough already, Wesley Crusher is going to be playing the Boy Wonder. Sony has built up a lot of excitement for DC Universe Online with only the announced voice cast for the game. Now, Sony's revealed some more more voices for the game, including Wil Wheaton. Wheaton is going to be taking on the role of Robin, Batman's sidekick. Meanwhile, Corey Burton will reprise his DC Animated Universe role as Braniac, Dwight Schultz is taking on duties as The Flash, and Arleen Sorkin will again voice Harley Quinn, the character she made cool enough in the DCAU to be incorporated into the comics' continuity. Even though the game's been delayed until next year, it sounds like the game's creators want it to be as good as they can possibly make it. Based on the actors assembled, though, it certainly sounds like things are progressing in the right direction.